What is included on a CHA tour? Who will we be traveling with? 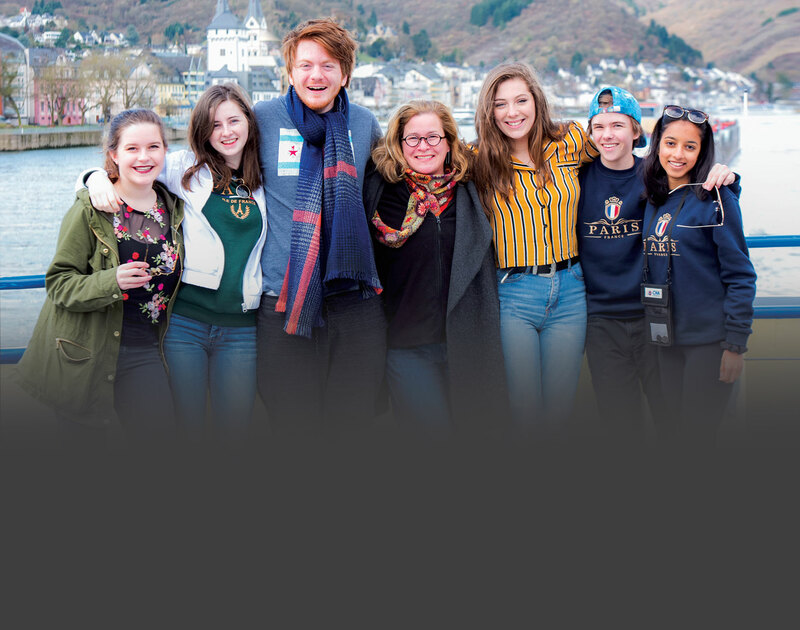 Generally speaking, several groups from different schools are merged into one large travel group (about 40-48 individuals) that is headed by a Tour Director who is in constant attendance throughout the tour. Since groups from all over the U.S. travel with CHA, students are given an opportunity to meet and make friends with people from different areas of the country. If a group has more than 40 participants, it may sometimes travel separately from other groups in its own touring motorcoach. How do I enroll on a CHA tour? Enrolling on a CHA tour is easy. Your teacher will give a copy of your tour itinerary along with CHA's Tour Enrollment Booklet which contains our Enrollment Form and Important Information Terms and Conditions. After you and your parents/guardians have reviewed this information, you may complete and mail your Tour Enrollment Form to CHA along with a payment in the amount of $95 to cover CHA's non-refundable Registration Fee. Your group leader may also give you instructions for you to enroll for your tour online. You will need a Group Access Code from your teacher and a major credit card to make your online payment to cover your Registration Fee and, if desired, your tour deposit and optional travel protection plan premium. What happens after I enroll on a CHA tour? Upon enrollment, you will receive a detailed Tour Account Statement listing the amounts and dates on which future tour payment are due. You will also receive several informative pamphlets to help you prepare for your trip which will answer your basic questions about your tour and will contain instructions on how to obtain passports and visas. (Visit the U.S. State Department's website for complete details on obtaining your own passport.) About one month before you leave, your teacher will give you CHA’s comprehensive pre-departure guide which will include a convenient packing list, colorful maps, shopping tips, suggested reading, and a daily touring notebook. You'll also receive a handy CHA backpack and luggage tag to use during your tour. Will I need to speak any foreign languages during the trip? No. It is possible to travel on a CHA tour knowing only English, because you will be accompanied by your professional CHA Tour Director. In addition to speaking English, your Tour Director and local guides will be multi-lingual. You’ll find that most shops and restaurants have an English-speaking staff. If you are interested in learning some foreign phrases, however, we recommend that you purchase some inexpensive pocket language guides in order to familiarize yourself with some commonly-used words and expressions. How safe is it to travel overseas? CHA has been conducting tours overseas for over 40 years, and the safety and welfare of their travelers have always been of paramount importance. CHA automatically covers each participant with a standard Travel Protection Plan. One section of the plan deals specifically with terrorism abroad and outlines the financial protection that is provided in the event of an unexpected cancellation. (A detailed explanation of CHA’s Travel Protection Plan will be sent to each participant after enrollment.) Also, CHA maintains offices throughout Europe, staffed by knowledgeable professionals who can assist your group in the event of an emergency. What will a typical touring day be like? Each morning following breakfast, you'll meet your group's assigned CHA Tour Director in the lobby of the hotel for all sightseeing activities scheduled for that day. Normally, when staying in the same city for several days, sightseeing tours will take place in the morning with afternoons free. When traveling from city to city, you'll spend most of your day touring a variety of places stopping to visit cities and other attractions. Dinner will be scheduled in the late afternoon or early evening. Depending on the pace of the tour, CHA itineraries provide a good mixture of sightseeing and free time. Normally, there is free time in the afternoons and evenings after dinner. Groups of three or more students can explore on their own during the day but must first report to the Group Counselor to inform him/her of where they are going and when they are planning to return. At night, students will not be permitted to go out on their own, but the adult chaperones should arrange activities in which the entire group or smaller groups can participate during the evening hours. What can we do during our free time? Optional excursions are sightseeing activities which serve as a supplement to the sightseeing already included on our tour. Scheduled during free time, these excursions can function as a valuable addition to your overall touring experience. Some examples of CHA’s optional excursions are: the Tower of London, the Seine River Cruise in Paris, and the Ancient Catacombs in Rome. Tour members may select from among the optional excursions available on their tour. Optional excursions are not included in the cost of the tour and must be purchased separately. Before you leave on your trip, you are responsible for getting your own passport and any necessary visas needed for travel to the countries on your tour. You must do this no later than 65 days before your departure. While you travel, you are responsible for your personal belongings and luggage, your ticket, you spending money, and taking care of yourself as best as you can while on tour by eating and sleeping regularly. Also, you must make an effort to be on time for all scheduled activities and to act respectfully towards your Tour Director, other CHA overseas staff, and all other travelers on your tour. Yes. During the tour, teachers will conduct bed-checks each night no later than midnight to ensure that all students are in their assigned hotel rooms. No students are allowed to leave the hotel after bed-check has been made. Can we visit friends or relatives during the trip? Yes, provided that it does not interfere with the group’s scheduled activities and the distance traveled is minimal. Be sure to inform your Group Counselor and your Tour Director of your plans. Please understand that CHA will not assume any responsibility when tour participants visit friends or relatives. Can I receive a discount if I make my own flight arrangements? What if I need to cancel after signing up? CHA has designed a Tour Cancellation & Refund Policy which is described in the CHA’s Important Information Terms & Conditions. Please read this carefully prior to enrolling as it details the penalties for cancellation prior to departure and instructions for cancellation with replacement. If you choose to purchase CHA's optional Travel Protection Plan, you will be covered for the cost of your tour (less CHA’s Registration Fee and the protection plan premium) in cases where your cancellation is the result of a medical emergency.